Rebecca Lan, Director of the Education Division, TECO in Los Angeles hosted a public lecture by Dr. Lan Pei-Chia from the Department of Sociology at National Taiwan University at the Cultural Center of TECO in Los Angeles on November 3. The public lecture in Chinese was jointly organized for the local community with the UCLA Asia Pacific Center. The Ministry of Education has worked with UCLA since 2014 promoting its Taiwan Studies Lectureship. Dr. Lan was invited to give a public lecture at UCLA and also at the Culture Center of Taipei Economic and Cultural Office (TECO) in Los Angeles. The public lecture at the Culture Center was the first Taiwan Studies public lecture held outside the UCLA campus. 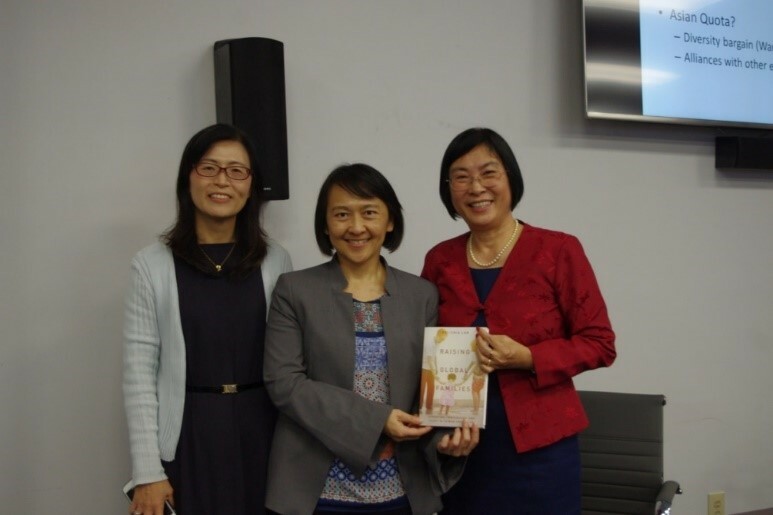 The public lectures focused on Dr. Lan’s book “Raising Global Families: Parenting, Immigration, and Class in Taiwan and the U.S.” published by Stanford University Press in July 2018. The book is a study on how immigrant families undertake and arrange their children’s education, an especially important concern for immigrants from Taiwan. Dr. Lan interviewed nearly 100 parents living in Taiwan and the United States and compared families of different classes and in different geographical locations. Her analysis revealed that despite sharing a similar ethnic cultural background, these parents have developed class-specific, context-sensitive strategies for arranging their children's education, care, and discipline, and for coping with the uncertainties caused by their changing surroundings. As well as comparing different approaches to raising children in the contexts of globalization and immigration, Dr. Lan also discussed the phenomenon of American society generally having exaggerated stereotypes of Chinese Americans, for example, the well-known “Tiger Mother” stereotype. There was a great deal of interaction and in-depth discussion between Dr. Lan, the host party, and the audience at each of the public lectures, and they also attracted press attention. Interested readers can listen to a podcast of Dr. Lan’s talk at UCLA on November 2, 2018 at http://international.ucla.edu/institute/podcasts/198019. Photo:From left: Rebecca Lan, Director of the Education Division of TECO in Los Angeles; Dr. Lan Pei-Chia, a professor in the Department of Sociology at National Taiwan University; and Dr. Min Zhou, Director of the UCLA Asia Pacific Center.